These tech deals will be given out on first-come-first-serve basis as Paytm has limited inventory of these products. You better be ready to keep your trigger fingers ready! Paytm Maha Cashback Sale on Paytm Mall is currently underway and will last till October 15. Shoppers also stand a chance to win 1gm gold coins every hour on the platform, and a Renault KWID everyday, during the sale which will put up products from 5000+ brands up for grabs. Today, Paytm will be holding some limited-period cracker deals on Paytm Mall between 12PM to 2PM, at a gap of half hour each. These deals will be given out on first-come-first-serve basis as Paytm has limited inventory of these products. You better be ready to keep your trigger fingers ready! Here are the four cracker deals Paytm will be offering on its Maha Cashback Sale today. A DSLR under Rs 10,000 is good news any day. For limited number of units and limited time, Paytm will be offering the Canon EOS 1300D for just Rs 9,999 after cashback. This is a steal deal on the DSLR for beginners from Canon. Watch out for the deal between 12PM to 2PM today. 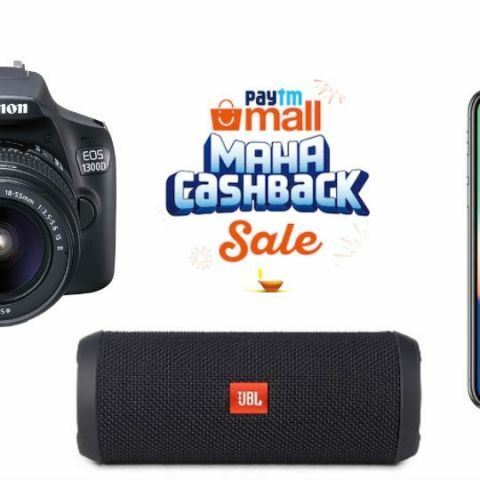 The JBL Flip 3 splash-proof bluetooth speaker is already on deal on Paytm Mall which is giving Rs 5000 worth of cashback on the speaker in the form of Rs 3500 on Flight Bookings, Rs 1200 as Movie Vouchers & Rs 300 on Recharge Vouchers. This brings the effective price of the speaker down to Rs 990. Between 12pm to 2pm, the deal could get even better, so watch out for the same. Looking for a printer this Diwali? You can’t go cheaper than an HP printer under Rs 500. The printer is already discounted on Paytm Mall, but between 12pm to 2pm today, the same will go on sale for Rs 499 post cashback. The biggest deal on the iPhone X is here. Paytm is offering a cashback of Rs 22,000 on Paytm Mall on the iPhone X, bringing its price down to Rs 67,358. This is the cheapest deal on the iPhone X across all ecommerce sales happening right now.